Pest control is important to the safety and health of your family because pests can carry harmful bacteria that can contaminate foods and cause illness. Harmful bacteria are spread by pests by contact with their hair, feces and urine. Some insects and pests can also cause serious damage to the actual structure of your home or business. Insects are not native to the indoors. Thus, Arrow focuses a lot of attention and preventive effort on the outside where insects live and breed. Since each property is unique, our treatment may vary depending on the type of pests, infestation level and size of the building. However most properties are treated using our proven, effective process. We start by inspecting the property to find what type of insects you may be having a problem with, and also to identify potential entry points and problem areas. 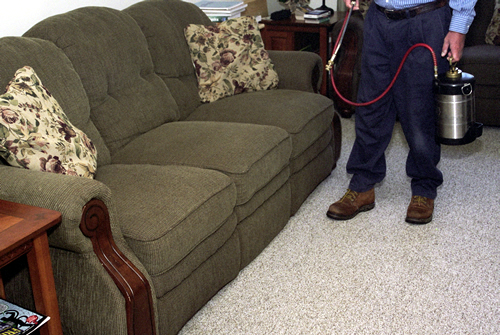 We then apply a thorough initial treatment on the inside of your home or business with low odor chemicals. Next our attention is focused on your the building exterior. We treat the exterior with slow release products to protect your property 24 hours a day from invading pests. And with all our regularly scheduled services if you have a problem, we'll be back to take care of it for you. Our Bi-Monthly Pest control program is our most popular for residential pest control. With this program Arrow Pest will visit your home once every other month. On the initial service call, we'll treat both the interior and the exterior of your home. After that we'll return every other month to re-treat the exterior perimeter of your home. This program is very effective as the consistent protection of the perimeter stops pests which live and breed outside from ever getting inside of the structure. Arrow pest provides a 100% guarantee on our pest control services, which covers the interior of your home, so in the event that you see pests reappearing inside, we'll visit for a follow up and treat as necessary. Since the Bi-Monthly program is applied outdoors, it is not necessary for you to be home for us to treat after the first visit. Another popular option we offer to protect your home from unwanted pests is our Quarterly Program. The Quarterly Program features recurring service to your home every three months. On each visit we'll treat both inside and outside the home. Our quarterly application of low odor, safe and highly effective pesticide is a great way to make sure that your home stays pest free year round. Similar to our Bi-Monthly program, this servioce is 100% guaranteed, meaning that we'll retreat as necessary between quarterly visits at no additional charge if needed. We also offer one time treatments. We start by inspecting your property to identify what type of insects you may be having a problem with. We then treat the inside and outside of you home providing the same high attention to detail as we do with our service programs. The Copper Blocker Pest Stopper is an additional treatment available from Arrow pest. This is a prevention product made of pure copper mesh cloth that is packed into openings to keep out all kinds of unwanted pests. The ability to fill voids of all kinds and pack tightly makes Copper Blocker perfect for access control. Use for ants, spiders, scorpions, crickets small birds, rodents and most insects. We're experts at installing Copper Blocker in all weep holes around foundation to stop pests from entering house. Once packed, pushed or stuffed in place, pests can’t remove it and it seals cracks, gaps, seams and small structural flaws. This product packs better than steel wool and outlasts expanding foam. Getting Stared with Effective, Affordable Pest Control is Easy! Just give us a call to schedule service, or with any questions you may have about our pest and termite control services. We're ready to get started right away.